SyvekExcel utilizes poly-N-acetyl glucosamine fibers derived from microalgae to assist in obtaining and maintaining hemostasis. Utilized in 1000+ hospitals nationwide following radial and femoral catheterization. SyvekNT® is intended for the promotion of rapid control of bleeding in patients following hemodialysis and in patients on anticoagulation therapy. SyvekNT is intended for use in the local management of bleeding wounds such as vascular access site, percutaneous catheters or tubes and surgical debridement. 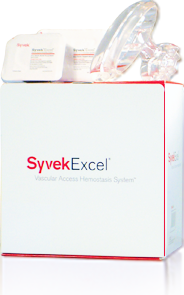 SyvekExcel® is intended for use following femoral vascular catheterization procedures to assist in obtaining and maintaining hemostasis. PRECAUTIONS: There are no known contraindications to the use of SyvekNT®. Longer compression may be necessary for hypertensive or obese patients. There are no known contraindications to the use of SyvekExcel®. Longer compression may be necessary for hypertensive or obese patients. Ghitis A, Cusnir H, Salajka H, et al. Cardiovasc Revasc Med. 2008; 9(2):128. Hirsch JA, Reddy SA, Capasso WE,et al. Tech Vasc Interv Radiol. 2003;6:92-95.